Cotton swabs are sending thousands of children to emergency rooms across the country. NBC news and other media reported recently that the problem has increased to the point where about 34 children a day are injured by Q-tips. And amazingly, about two-thirds of them are under the age of 8. Approximately 77% of the children were injured when they were using Q-tips themselves after seeing their parents do it. One way that you can prevent your child from suffering Q-tip injuries is to not use them. Why Don’t You Need Q-tips? Ear wax is a good thing because it is designed to keep the ears clean. It protects and lubricates the ear and even acts as an antibacterial agent. Ear wax is formed toward the outside of the ear in order to move dust, dirt and other potentially harmful substances out of the ear. 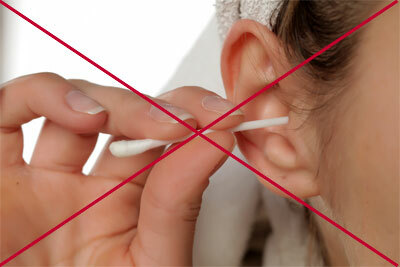 Q-tips reverse that process and push the wax back toward the eardrum where it does not belong. If you notice that your child seems to have trouble hearing, see an Ear, Nose, Throat specialist (ENT – also known as an otolaryngologist) who can examine your child and diagnose the cause of the hearing loss. If it is caused by excess ear wax the physician can remove it. A visit to the doctor every six or twelve months will keep the ears clean of excessive wax. The ear is a very sensitive organ. You can easily puncture your eardrum or that of your child with a Q-tip. The eardrum is a very sensitive tissue inside the ear and plays a very important role in hearing. When sounds enter the ear and reach the eardrum, the eardrum begins to vibrate. Those sounds are then passed to the bones and nerves in the ear for processing by the brain. If the eardrum is perforated it can decrease hearing and cause pain. Sometimes the perforation, or hole, will heal by itself but it depends upon the size of the hole and its exact location in the eardrum. In some cases, surgery is necessary to repair the hole. The situation can become even more complicated if water or bacteria get through the hole in the eardrum and enter the middle ear. It’s safe to say that the best course of action is to stop using Q-tips in order to avoid damaging the eardrum in the first place. A quick review of online news and information sites regarding Q-tip use reveals headlines like, “Why You Should Seriously Never Use Q-Tips Inside Your Ears”, “Why You Really, Truly Should Not Put Q-Tips Into Your Ears”, and “No More Q-tips! Your Ears Really are Self-Cleaning”. Take the Q-tips out of the bathroom. There are many other uses for them like applying make-up and cleaning small parts of machinery. You can even dye them green and turn them into trees for your child’s school project. Just don’t use them to clean your ears.